CSP VW Parts are made in Germany using the finest materials and workmanship for the highest quality parts possible. CSP VW products are German engineered and manufactured to give you the guarantee of a correctly designed and fitting part for your Volkswagen. 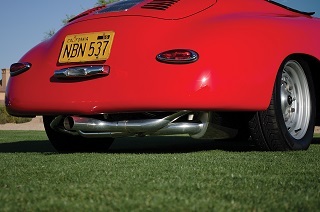 CSP products for your VW range from weld in beam adjusters to stainless steel python exhaust and everything in between. CSP parts are tested and proven on the racetracks and autobahns of Europe. Many of the CSP parts must pass TUV certification, which is a stringent European test to make sure the replacement parts are engineered/perform/fit and function as well as or better than the original equipment parts that came on the vehicle. CSP brake kits utilize the best materials and design to give you a proper fitting part that will outlast anything else on the market, CSP shifters feature a high quality leather boot and all steel construction, CSP aluminum valve covers combine great looks with superior performance, designed to clear most springs and rockers and made in Germany. CSP dual carb linkage comes in many configurations for most carburetors and shrouds and has no rival in quality or ease of adjustment. Many other Quality CSP VW parts are in stock and ready to ship, check them out! Piersideparts.net is the largest supplier of CSP VW parts in the United States. We have more of the CSP parts you want in stock than anybody! you can count on piersideparts.net to bring you the highest quality parts at the best prices. CSP Stainless Steel J Tubes 1 3/4" pr.